21st September 1944 between Lent and Elst. Irish Guards Group try to smash through the German lines in a attempt to reach 1st Airborne in Arnhem. Despite the title their are lots of tanks in this scenario. 1 Comment on "No Country for Tanks"
Good job on the scenario! Lots of ways to approach, and a variety of weapons to use. I would suggest adding one or two AT guns to the German setup. 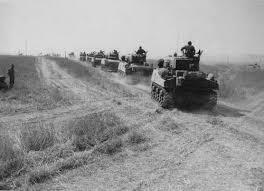 The challenge is to get to the German tanks without losing too many of your own. So, do you just attempt to overpower them, or do you attempt to sneak and flank? Germans surrendered with 20 minutes left. Thank you for the challenge!